As I begin year two of Currently, Kelsie, I'm starting to see my approach to blogging change. If I'm honest, a whole lot of year one was figuring out what I wanted the blog to be, how to really grow my audience, and what I wanted to focus my writing on. I didn't do a lot of research "pre-blogging". I chose more of the "learn it as I go" route. But now, I feel like I'm starting to get into a groove when it comes to crafting a post. 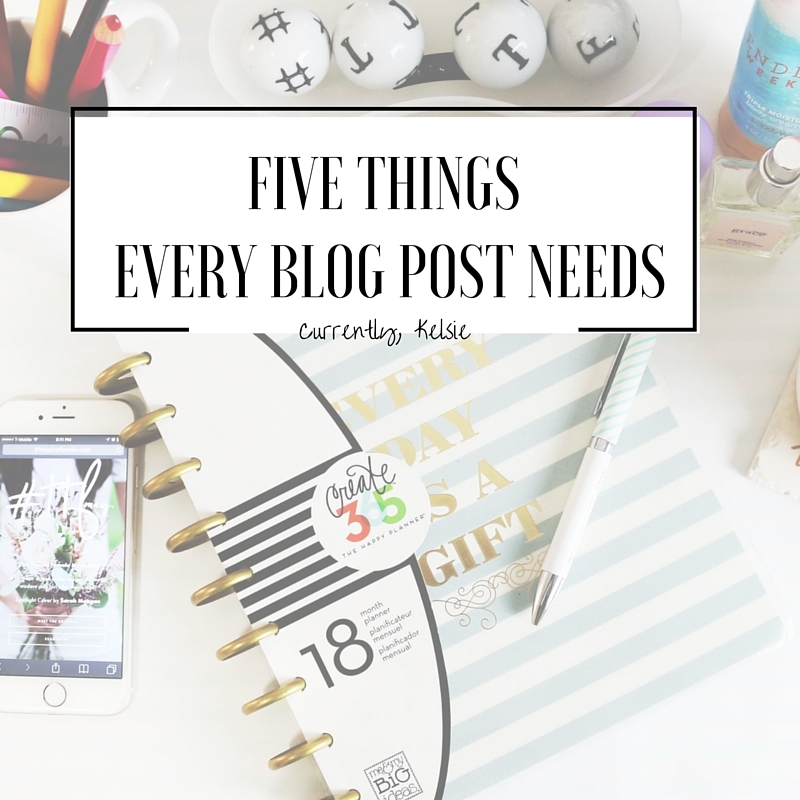 So here are five things every blog post needs, and some tips on how to make them happen. A blog post isn't anything without meaningful content. You can have all the bells and whistles in the world, but if your actual content doesn't have purpose that your audience finds valuable, they won't keep reading. What are things you've always wanted to know more about? What do you know that's worth sharing with others? Titles. Are. Everything. Readers want to know what your post is about (and what they'll get out of reading it), just from a few simple words. Not to mention, this title will be what readers look for in your archives, on google searches, and in your pin-worth pictures! If you need help figuring out how to make your post more SEO Friendly, check out this awesome post from Yoast! If titles are everything, pictures are a close second. You know what they say: a picture is worth a thousand words. When choosing a photo, try to take your own, and make it as high quality as possible. If that's not possible, find some free stock photos on great websites like Unsplash or Pexels. Definitely be careful not to use photos that aren't free use without citing your source. After choosing your photo, work to brand your image using editing sites like Photoshop, Canva, or PicMonkey. Keep in mind, longer photos get more "view time" on Pinterest. If the photo in your post isn't pin worthy, odds are it won't be pinned (and then you miss out on traffic). It's a fact of blogging: not all of your readers will see every single post you've written. So if you've got great, relevant posts that tie seamlessly into your post, link them up! Let your readers know that you've got helpful information that's worth their time, and encourage them to read more of your words. It's also a good idea to have a "popular posts" or "recent posts" widget or section on your blog for people to read some of your best work! Once your readers get to the end of your post, give them a chance to act. Let them know how to follow you on social media, how to join your email subscription list, or even share other posts they should check out on the same topic. How are readers supposed to do these things if they don't know that they can? Sometimes, it just takes simply asking. It's also a great idea to embed these things into the end of a post, or make a short list for them! I hope these tips help you navigate your posts, and maybe look at them in a new way! Are you following along with Currently, Kelsie on Facebook? Join us! We're just getting started with our blog (http://emma-and-jw.com/) so we SO appreciate this kind of information. Thanks for sharing! That's awesome! You are so welcome :) Have a great time with it! These are all definitely must-do's and haves for a blog. Thank you for your advice! I've been blogging since 2012, but am just now working on getting serious about it. Quality content definitely matters as well as quality images! As I work on new content, I am also starting to go back through old posts and update to match how my blog looks now. And linking to past posts - that is such a great tip! Something I am trying to work on too! That's great, Becky! I hope you're able to try something new from this post! Great advice! Thanks for the tips. Linking to previous content is something I need to work on consistently. I'm definitely getting better at it but I do still miss opportunities. That is something I'm still working on as well. It is just a great idea to show other people what they can read from you! Good advice. Hopefully, I do every single one of them within my posts! Have you seen the movie WORDS AND PICTURES? Interesting....it was the great debate "is a picture really worth a thousand words?" A couple risque scenes but overall, good message and entertaining. Visiting from WWI, we are neighbors! Thank you, Susan. I haven't seen it. Sounds interesting! Thanks for stopping by! Great advice! Will definitely be pinning this for later. Congrats on the 2 year mark! Great tips! I really need to stop being lazy when writing posts, I mean how hard is it to change the name of my images...not at all! Take the extra few minutes. You are so right! It just takes that extra step, and it can be so so worth it! These are all so true! Linking to past posts and having a recent/popular posts section somewhere is such a great way to make sure people stick around. You do a great job at that! Thank you, Lauren! I agree. 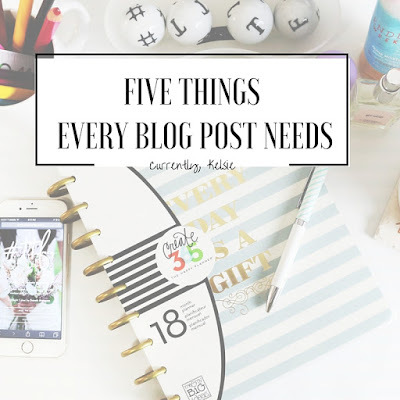 Thees are all great tips and definitely important aspects of blogging! Great tips! I think once you start blogging these things are so important. Thanks, Brittany. I have definitely seen these to be important! This is so informational.I definitely need the info on SEO so i'm pinning this for future reference. Thank You for sharing!!! I did the same thing with my blog, little research and figured I'd learn along the way. I definitely needed to see number 2 because I don't know much about SEO so thanks for that! I'm right there with you, Jovania! Best of luck! I probably should have done the same...but then again, I'm kind of glad I jumped in when I did. I hope you're having a blast with your blog! Great tips, Kelsie! I've not heard of Unsplash; I'll have to check it out. Thanks, Abby! I love Unsplash! I've been really working on making my titles more SEO friendly, Coschedule's headline analyzer is a lifesaver for that though! That's awesome, Rubi! Keep up the good work! Great tips! I absolutely agree with each tip. Pin worthy pics is so important. I also love the idea of linking to older related posts. I have found that helps me even think of ideas for new posts. Sometimes I'll be writing a post and thinking , I wish I had this post to link back on. Then I'll create it. If that makes sense. Anyways, great post! Thanks so much, Danielle! That totally makes sense, and I love how it springs off ideas for new posts! Yay, Channing! I think figuring out a brand is a process, and there's nothing wrong with that! I have invested very little financially into my blog thus far...that way if I decide I really want to take the next leap, I don't have to start all over- since I haven't put a ton of money into it yet anyways! Awesome tips! I wish I would've known these in my beginning days of blogging. I don't think I did any of this back in the day! Agreed! It has been a learning process for sure! This is such a great reminder! Thank you for sharing! great tips! I often go back to my older posts and link with new porsts! Thanks, Jessica! That's a great idea. These are great tips. I am doing everything expect linking to previous content that i should do. That's a great idea for sure! And worth your time. Great tips! I've started internally linking in my posts a lot more now, I just need to go back and do the same for older posts. Coming up with cool headlines is something that I find a bit challenging at times. All part of the learning experience! Thanks, Bree! You are so right! Great tips! I've been trying to get better about linking past posts in new ones. It's an excellent way to drive more traffic! Absolutey, Rachel! I hope that works well for you! Awesome pointers! I definitely need to remember to include a call to action going forward. That's the hardest thing for me to remember, for sure. I don't want to feel pushy, but I know people may find that info helpful! I'm really bad with call to actions. But the other's I think I've got down pat. YOAST is great for SEO. That's my downside as well! Great advice! I need to start making my graphics more "pin worthy" aka the longer pins - I just haven't even tried to do that yet. I love Canva, though! Thanks, Nina! I love Canva as well! Really great tips. Isn't it fun to look back and see how far you've come from the beginning? I know I'm thinking about that a lot as I approach my 1 year "blogiversary". You're right, Angela! It is SO much fun! What widget do you use for your popular posts? Canva is my favorite :) I'm just finally getting more organized in the blog world, so this is super helpful. Thanks! Canva is really awesome! I'm so glad that you found it helpful! Great tips! Thanks for sharing. Love it! Thank you!! I am still learning all of these things as well and its great to have them all in one spot! Great tips, Kelsie! I try to do all of these things normally, but it's a great reminder! Thanks, Hannah! I always need this reminder too. As a new blogger, these tips are very helpful! I'm in the year one stage where 'pre-blogging' doesn't quite exist yet ;) Hopefully one day! I loved what you shared and found it inspiring! Yay! I'm so happy for you! Have a blast with blogging. Great tips. As a "new" blogger I am always looking for ways to improve. Thanks, Danielle! I think we always need to be growing and improving! Great tips, thank you so much for sharing! I need to add a more direct CTA to all of my posts. I've seriously been lacking in that department. Thanks for reading, Shannon. That's the hardest thing for me too! I know what you mean! I think that asking them to do or click on something else can help and be a more "anonymous" response. Thank you, Kelsie, for sharing such great blogging tips! I pinned it to my blogging board so new bloggers can read it! Ashleigh, thanks so much for sharing! I love these! Could you tell me which plug in you use for your share buttons? Thanks, MaeRyan! My plug ins are actually just code through the nucleare template. If you give me your email I can send you the script! Great advice! I also chose to learn as you go and wish I would've learned before I started! There is definitely something to be said for learning ahead of time! Thanks so much for sharing this! I'm new to self-hosting, so still trying to figure out a lot. Thanks for the call to action tip. Do you know how to add a bar to suggest email subscriptions beneath each post? I have yet to figure that one out! That's awesome! You are so welcome. Who do you use for email subscriptions? I use mail chimp, and they have several places that let you embed html script or a widget into any area that you want to. I would recommend using Mailchimp and then it's as simple as copying script! Meaningful content - that is so so important! Agreed, Emma! That's the most important part! I always forget to add links to previous content! As a reader, I click on those links so I should remember to add them! I totally click on them as a reader as well! Definitely agree with you on the importance of titles! I'm still working on making my titles SEO friendly, short and simple! This is a great list you've complied! Great info! Thanks for sharing. I need to get better on adding links to previous content! Thanks so much, Miranda! There is always room for all of us to grow and learn! I think I struggle with the call to action... Thank you for all of these! I think that's the hardest part, Emily! Thanks so much, Justine! Thanks for reading! Great tips! It's always hard to remember that you need to do more than just focus on quality content. All the little things matter, too. I'm always stuck finding a call to action, but I'm working on it! Thanks you, Rachel! I agree- the little things definitely matter! Great tips! I really need to work on my call to action bits - I try to be subtle, but then end up being too subtle, lol. Haha, I know exactly what you mean! It's like a more pushy subtle. Those are all great tips! I installed Yoast not long ago, and it's helped a lot!